The Skype for Business conversation is changing from ‘when’ to ‘how’. Maintel’s David Groves has seen a shift in CIO attitudes, as Skype4B goes from ‘we’ll see’ to ‘good enough’. One of the questions I’ve been asked by our customers over the past few years is “when should I consider Microsoft Skype for Business?” For a while my stock answer was –“wait until it gets better”. But at what point does an emerging technology move from being merely interesting, to something that organisations want to use and pay for? And has Skype for Business now reached that stage? Technology goes from being a want to a need when it gets ‘good enough’ – and when that shift happens really depends on what you actually need from it. When I first started out in telecoms, the digital PBX had become the norm. It did almost everything that the old electromechanical branch exchanges could do apart from power-fail analogue connections: if the power failed (and your electronic PBX was turned off), you should still be able to call 999. Despite the fact that electronic PBXs didn’t always do this very well, they had almost completely replaced their predecessors, because they were cheaper, more reliable and were ‘good enough’. Fast forward a few years, and the IP PBX became the new technology. The voice quality wasn’t always as good as its predecessors, but you didn’t have to run cables for voice alongside those for data – which saved quite a bit of money. They were ‘good enough’. Then unified communications came along, and everyone started using video and presence. In reality, a few brave souls bought the technology, but it wasn’t always used. 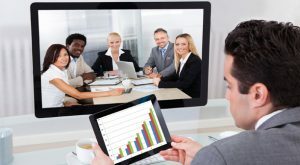 Getting video to work for everyone, particularly over Wi-Fi and LANs originally designed to support the needs of a handful of executives proved a challenge. Most of the vendors just tacked on new features without thinking how users would utilise them. The result now is that you can buy a unified communication system from most of the traditional PBX vendors, but you might have to start a different application to switch from voice to video, or to present from your desktop – it’s not always as ‘unified’ as you might expect. What Microsoft have done incredibly well is recognise that it needs to be ‘good enough’ for most people. Skype for Business is increasingly ready for business. Of course, there are use cases where Skype for Business isn’t ready yet: I wouldn’t yet deploy it to run a call centre (but stay tuned – we’ll be announcing something soon! ), and I don’t think that retailers will be deploying Skype for business in all their shops in the near future, but Microsoft have made a product that is more than just ‘good enough’ for knowledge workers, and that’s a lot of people. And I can see that in the questions our customers are asking me. I’m now being asked, “What can you do to help me implement Skype for Business?”. That question takes a little longer to answer, but I think you’ll like what we have to say.